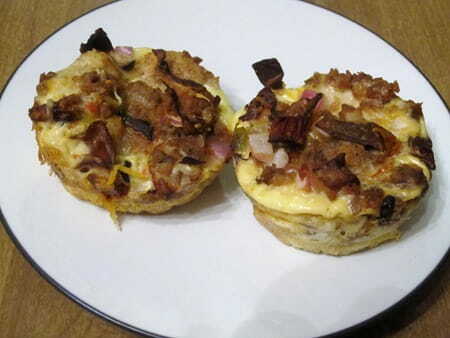 Enjoy these magnificent Mini Mushroom & Sausage Quiches for your frugal healthy breakfast! Position rack in center of oven and preheat it to 325°F. Coat a nonstick muffin tin with cooking spray Heat a large nonstick skillet over medium-high heat. Add sausage and cook until browned. Transfer to a bowl to cool. Heat oil in the same pan as sausages were in. Add mushrooms and cook, stirring often, 5 to 7 minutes. Transfer mushrooms to the bowl with the sausage. Let cool for 5 minutes. Stir in red onion, salsa, and Mexican cheese. In a medium bowl, whisk eggs, egg whites, milk, pepper, garlic powder, and seasoned salt. Divide the egg mixture evenly among the bread-coated muffin cups. Add a heaping tablespoon of the mushroom mixture on top of each cup. Bake until the tops begin to brown, about 20 minutes. Use a knife to separate quiches from edges of pan, then let cool on a wire rack for 5 minutes. Breakfast just got even better!